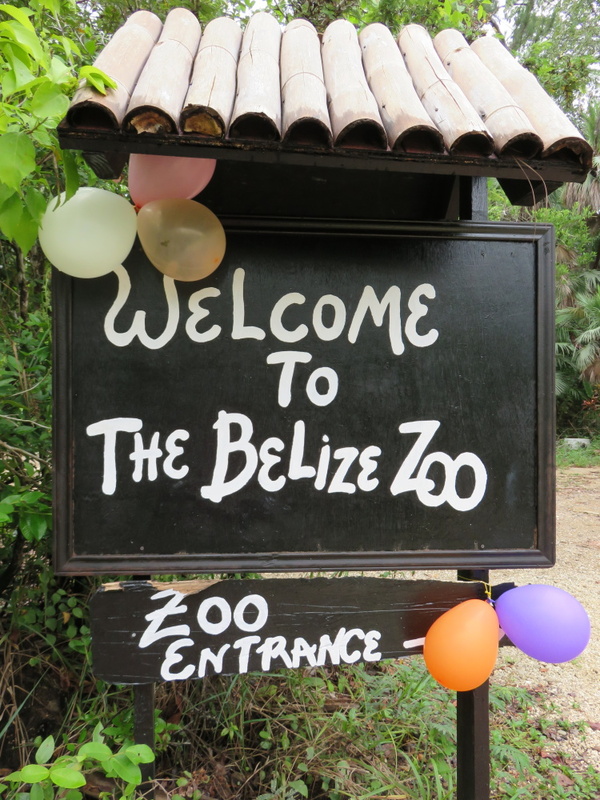 The Belize Zoo is an ABSOLUTELY must visit when you take a trip to Belize. If you live here, you should be stopping by as much as possible. 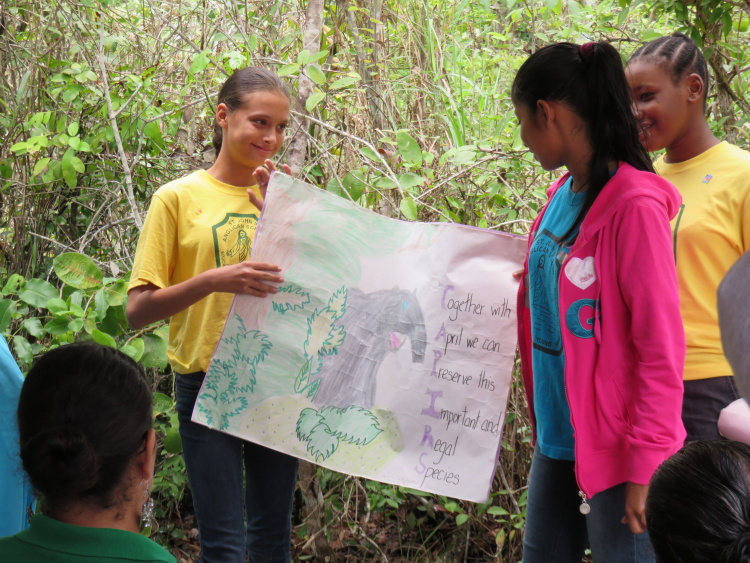 All animals are native to Belize. 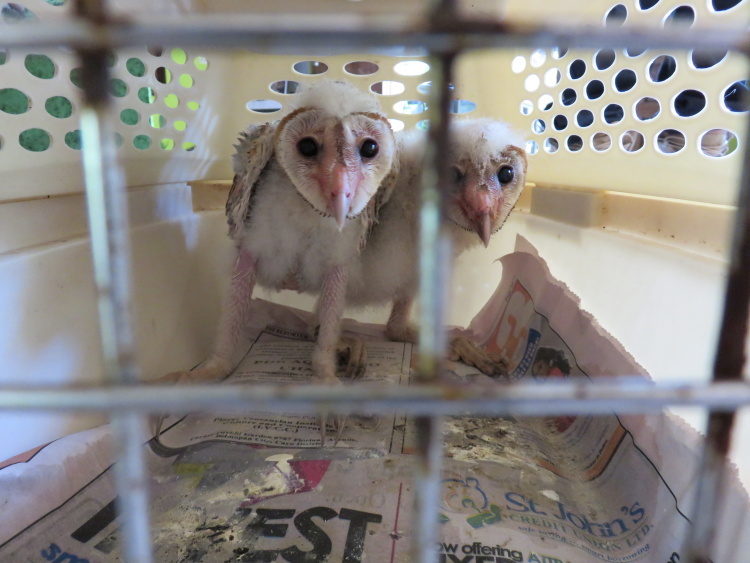 All animals are rescued from the wild. 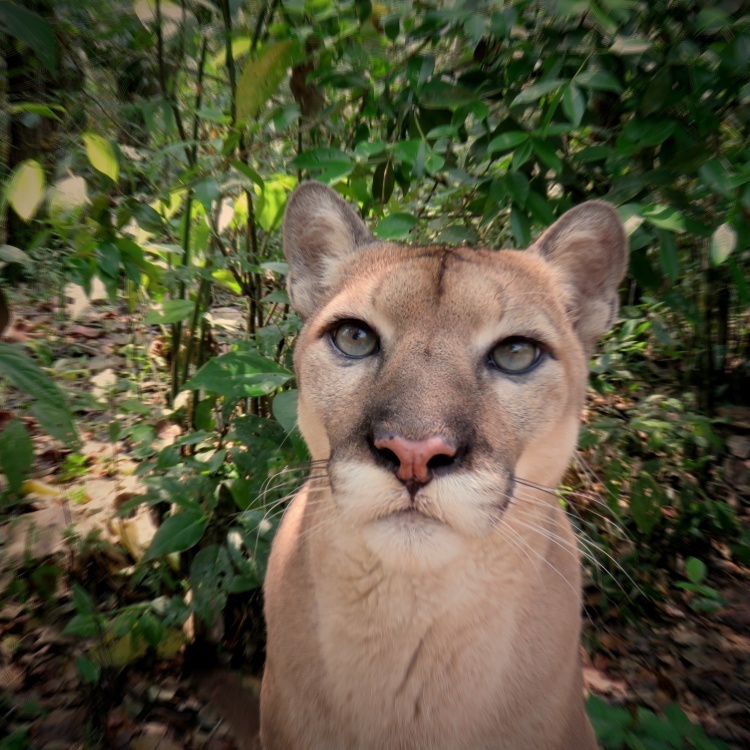 All in small beautiful natural enclosures that, if the animal isn’t busy, allow you some pretty amazing close-up encounters. Seeing Junior the Jaguar as a baby playing with his ball to him as an adult…you feel like they are YOUR animals. 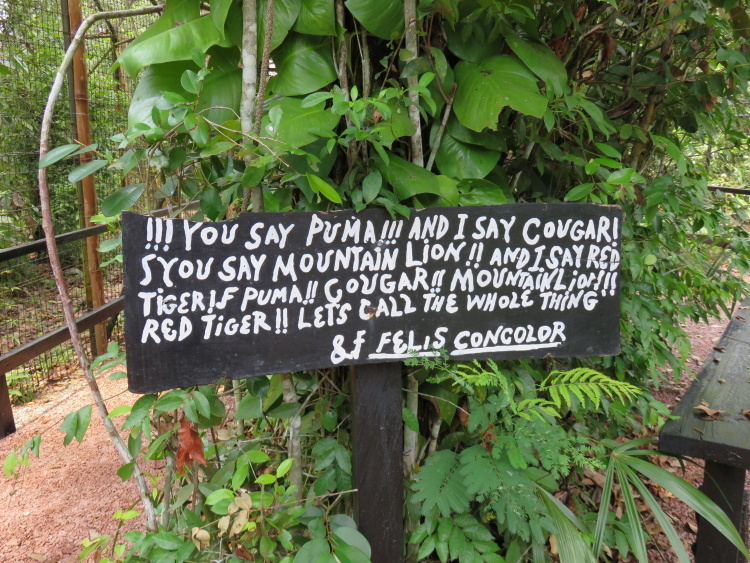 And they are Belize’s animals. But this one is mine all mine. Take a look at my new bestie Carlos. CAN. YOU. BELIEVE. how gorgeous he is? No zoom. None. But more on him later. 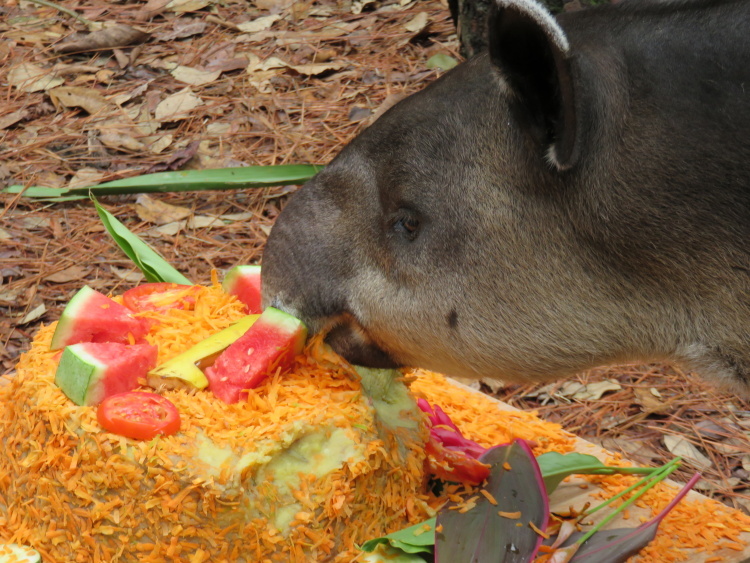 I was invited by my friend (a VIP guest) to the zoo for the celebration of National Tapir Day (April 27th) and for Fuego the Tapir’s first birthday. 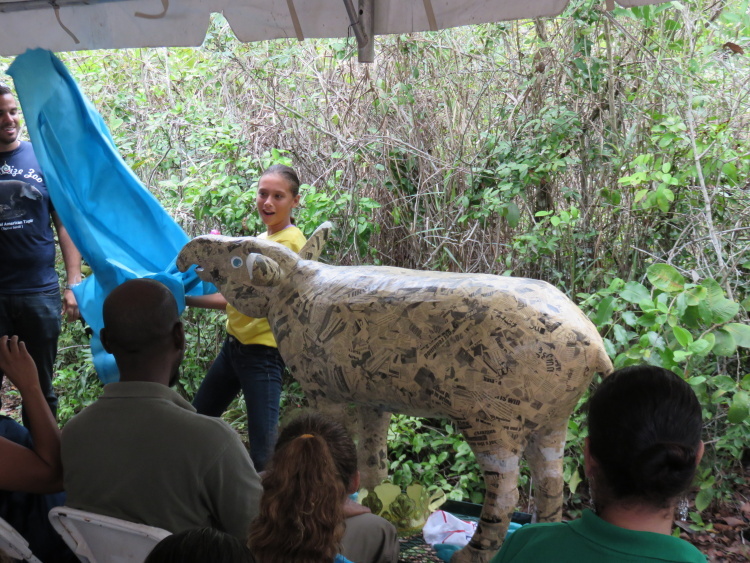 This celebration has been going on for YEARS but had celebrated Belize’s most famous national animal, April. 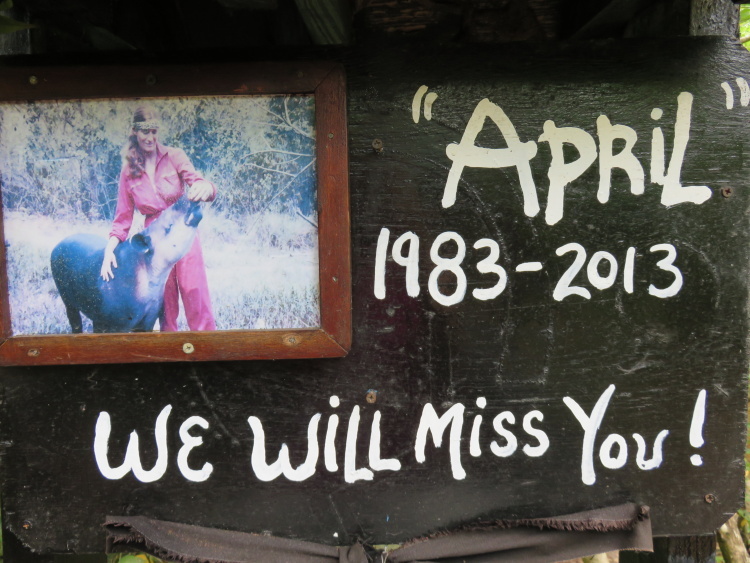 Poor April, the oldest tapir in the world in captivity, passed after 30 years as Belize’s tapir ambassador. 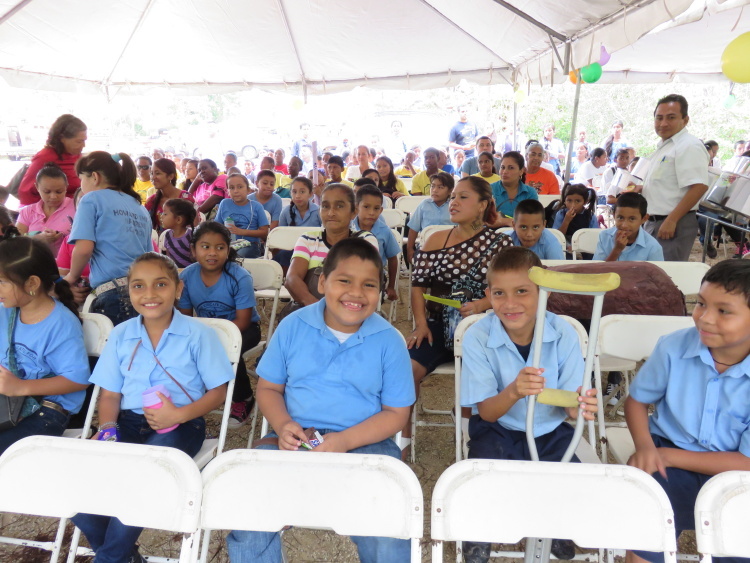 We arrived a few minutes late (SERIOUS crowd situation at the bus station) but just in time…the kids from Benque, Punta Gorda (who boarded their buses before dawn), Belize City and elsewhere were just being seated and VERY excited about the party. 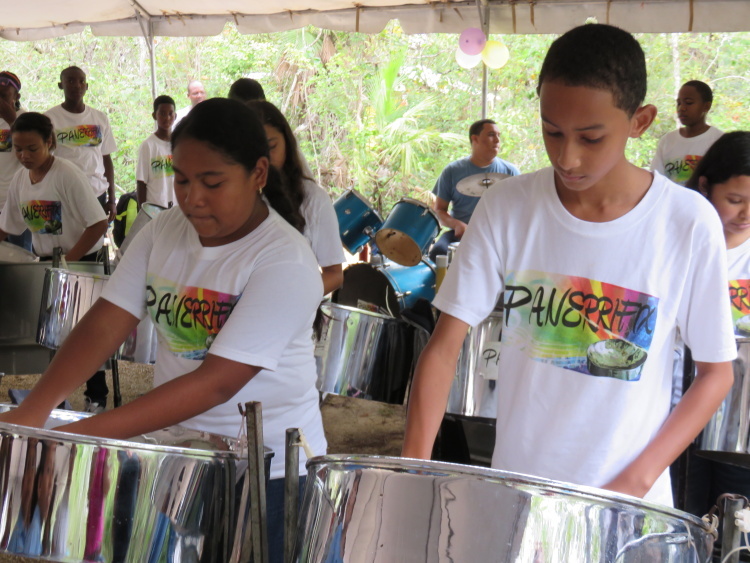 The Panerrifix Steel Drum band (awesome) started us off with the National Anthem. These kids are talented. 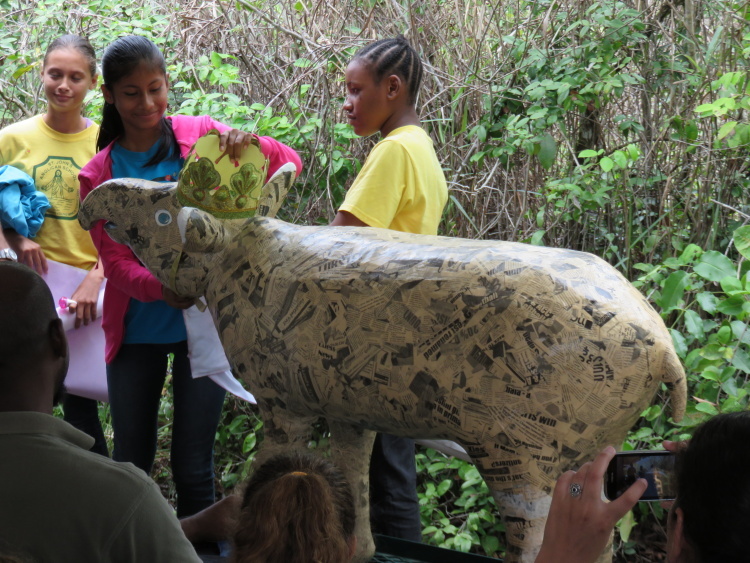 Some people spoke…Jamal from the zoo, the local area represetative and the Forrestry Department. 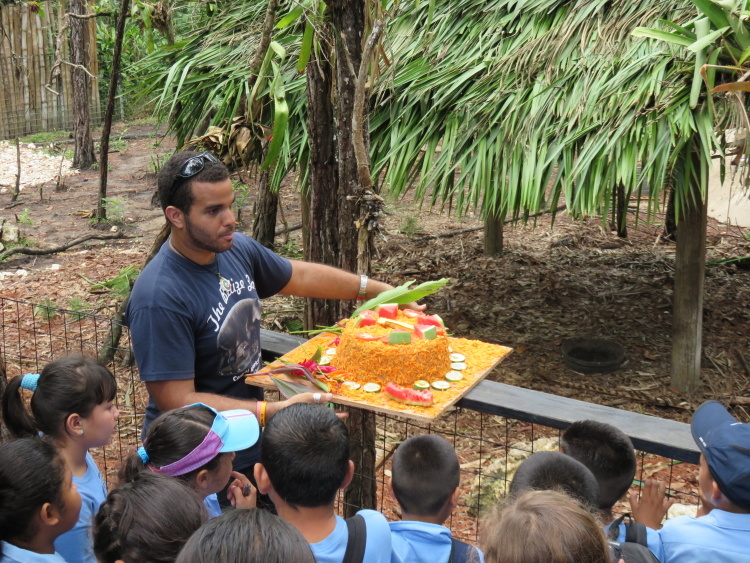 All about the amazing zoo and how it is our job to protect the animals of Belize. It’s important for so many reasons. 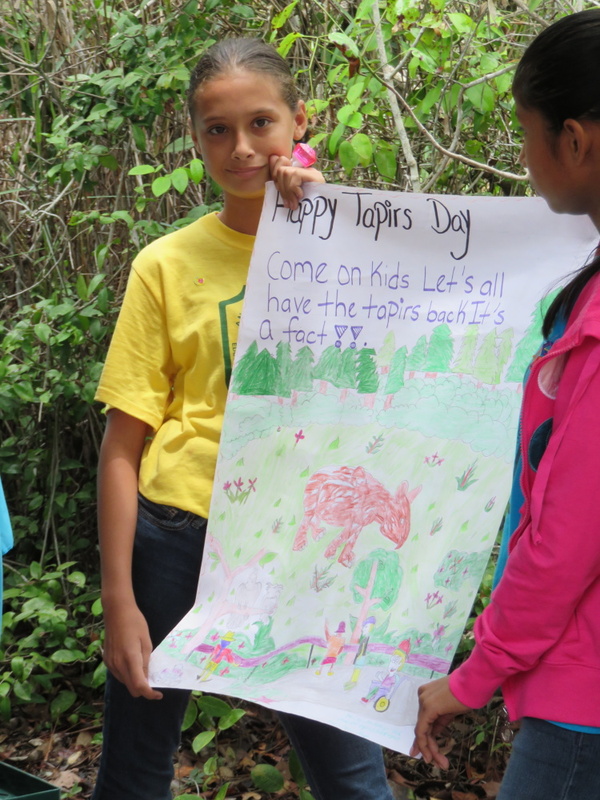 Very cute and very brave girls from Belize City shared why they think that national animal is important to protect. And then Miss Belize was uncovered and crown. Ta dah! 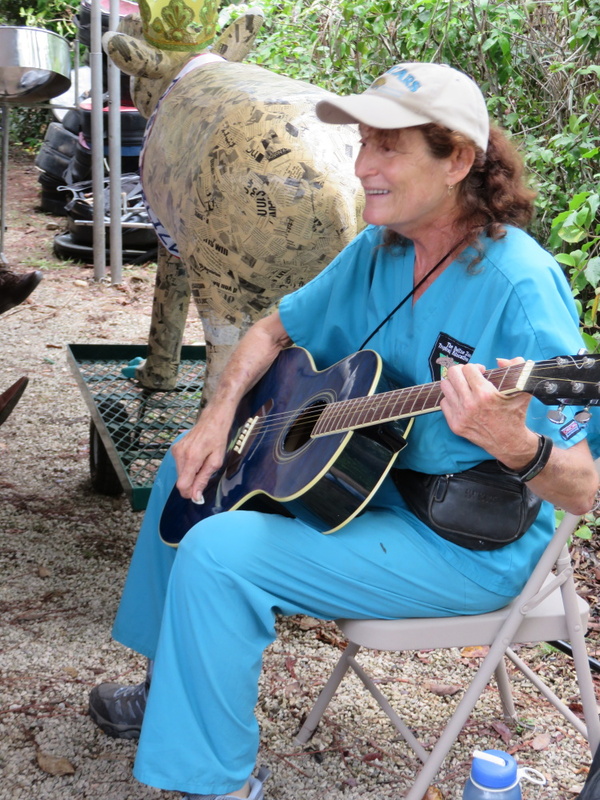 Next Sharon Matola, the founder of the Belize Zoo and fearless animal activist, got out her guitar and led the kids in a song that they got pretty into. 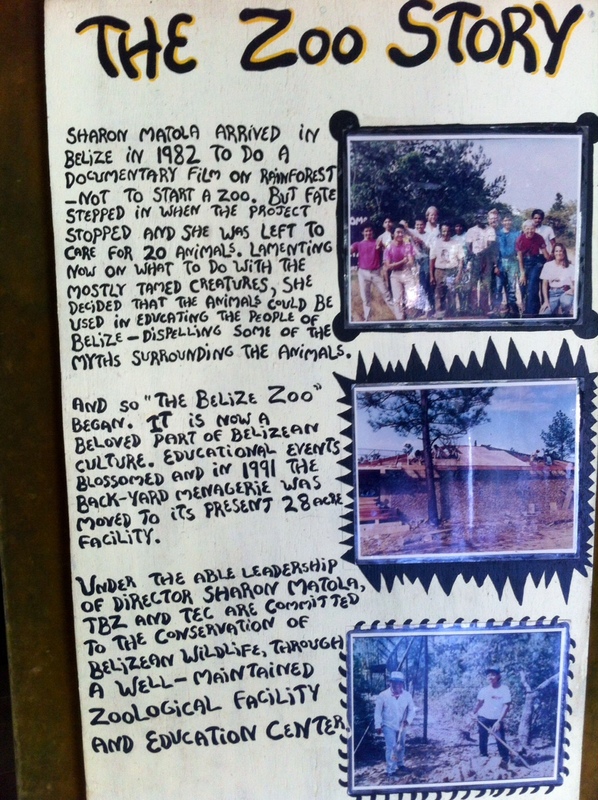 For some of Sharon’s story, here is the posting at the zoo. And for more, read the book “The Flight of the Scarlet Macaw: One Woman’s Fight to Save the World’s Most Beautiful Bird“. VERY interesting book about Belize and the fight to stop the building of the Chalillo Dam. Kids loved this song. Just saying the word “stinkin” had them cracking up each time. I looked on with my neighbor. 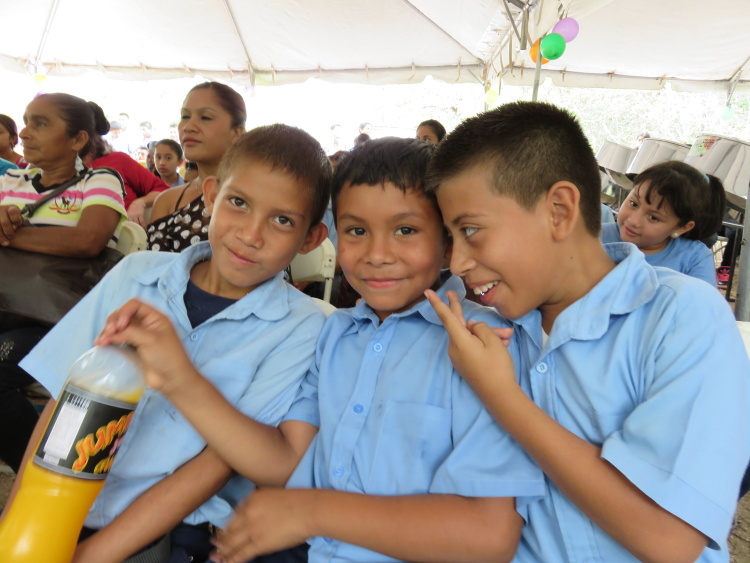 The kids got ready to go visit Fuego and to give him his cake. But quick! 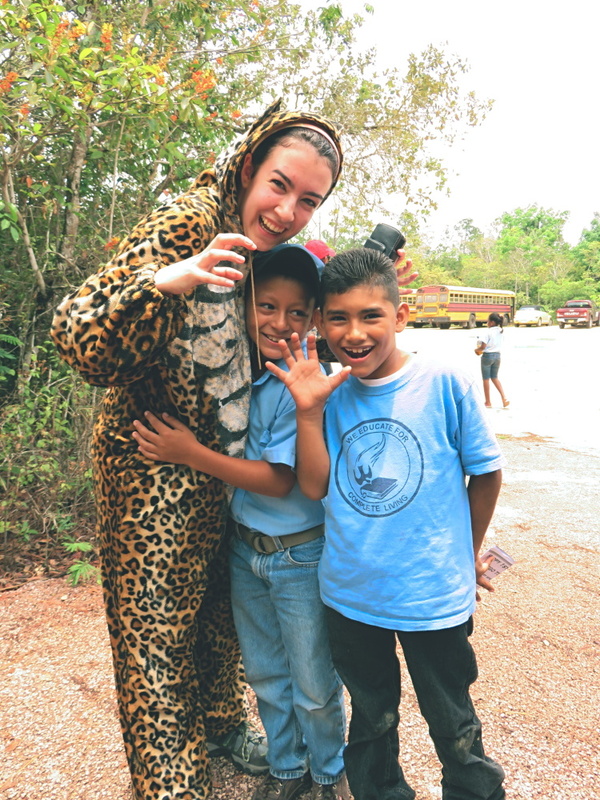 Some pictures with the zoo volunteers that subjected themselves to these suits in 90+ degree weather. That’s commitment! 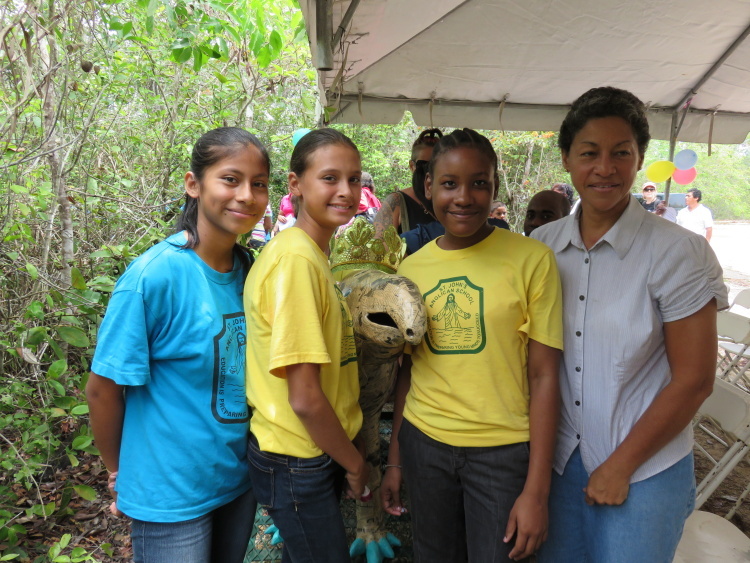 The presenters and the area representative from Belize City. 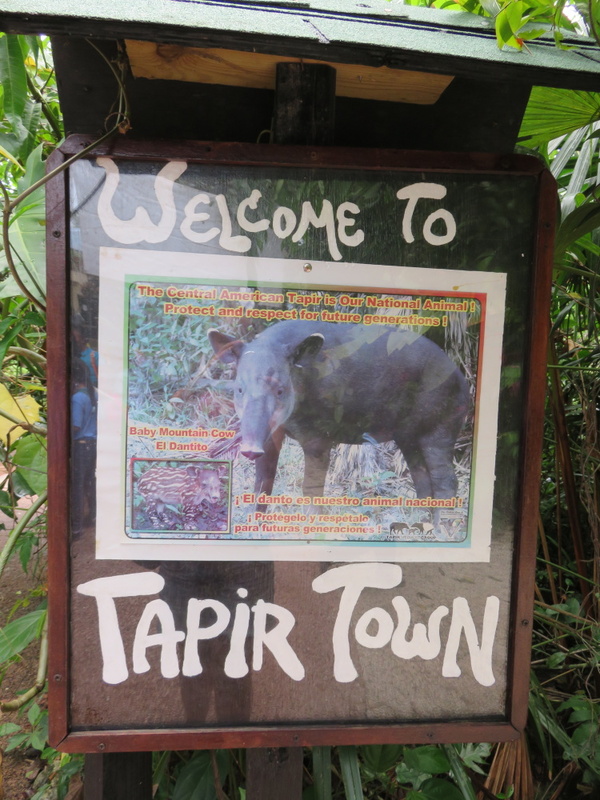 It’s time to get on down to Tapir Town. If you haven’t been to the zoo, it is absolutely gorgeous. And this time of year, even though it’s the dry season, it is also spring. 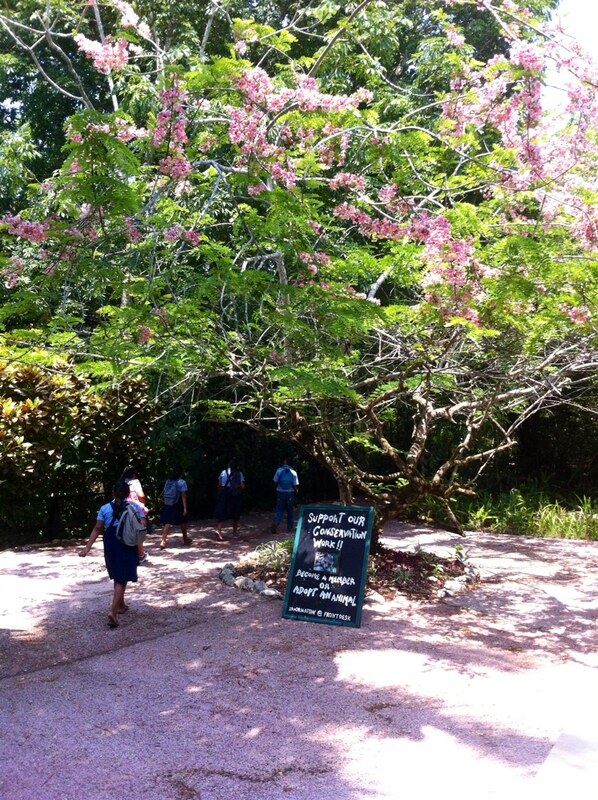 Flowers, lush trees, vines….beautiful. 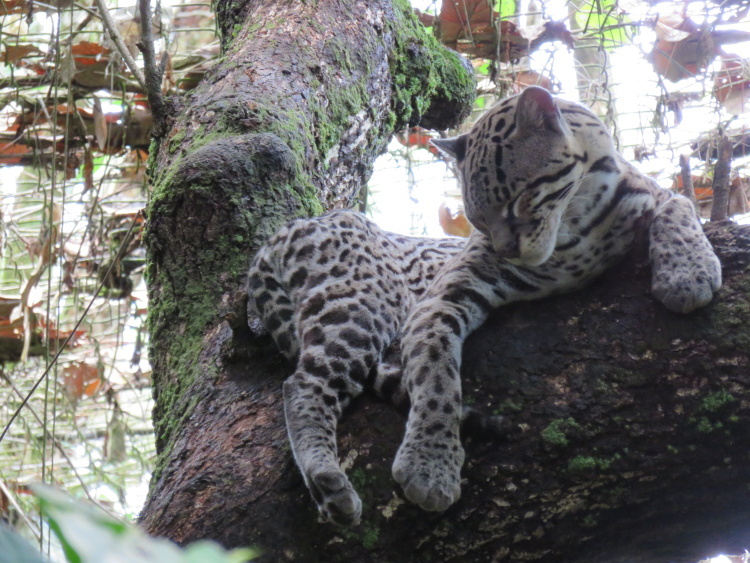 Fuego was rescued about one year ago when he was separated from his mom by a bush fire. 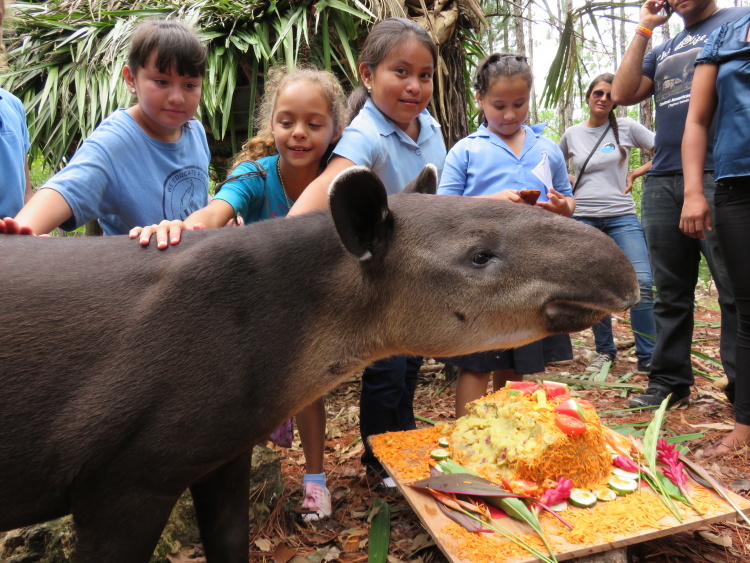 Super sad but now he is the tapir ambassador and lives VERY well. And he is one handsome fellow. Fuego loves it. HE LOVES IT! They let some of us in with Fuego to get his close-ups. HANDSOME and so gentle. Only 250lbs, he still has lots of room to grow. 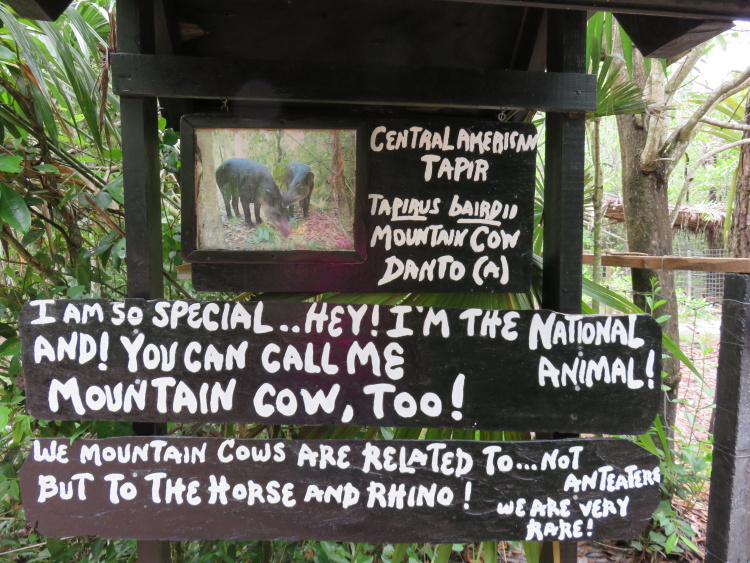 But it was time to leave Fuego to do his tapir things. 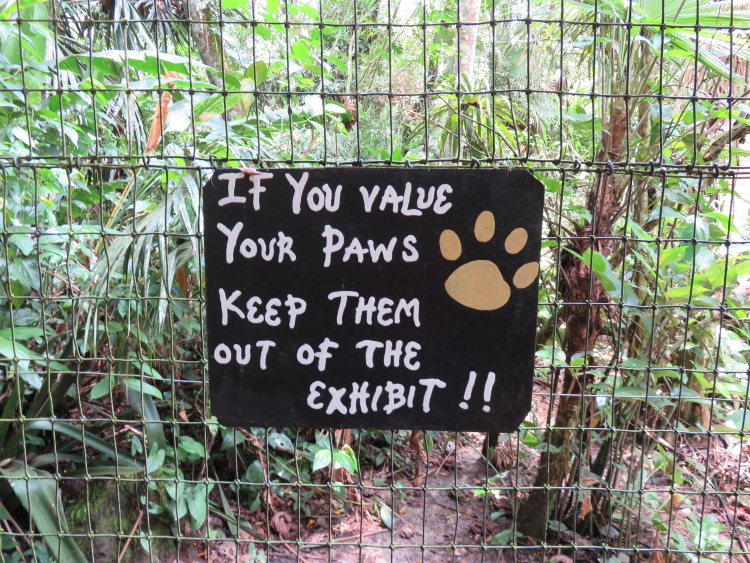 I wanted to quickly explore the zoo. And how can you NOT follow a sign like this. 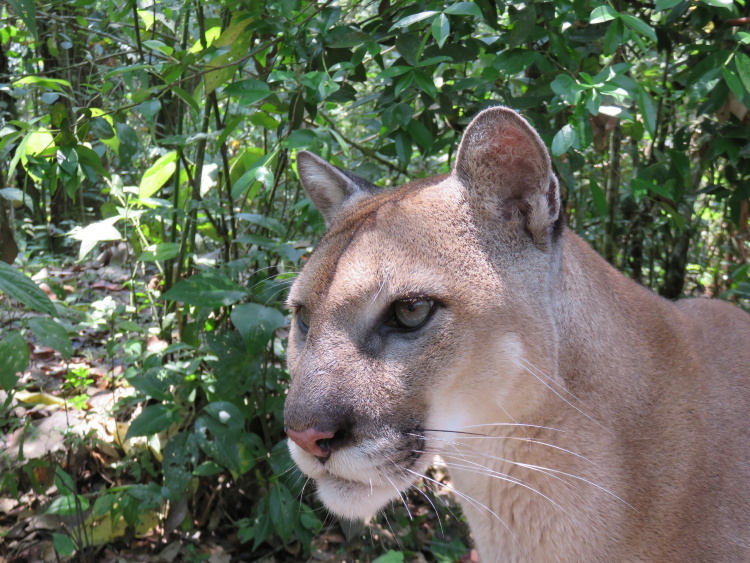 I stared sadly into the cage seeing nothing when a zoo employee came by TO FEED CARLOS THE PUMA. Is this luckiest day ever? He went back to get some chicken bits as a treat. This gorgeous cat came bounding out as soon as he heard the tupperware open. He is EXACTLY like my cats. The sound of a can open stops them from whatever they are doing. Which 99% of the time is sleeping. Just like Carlos. He came right up to us. I had to sit down on the ground. Too much for a cat lover like me. He started making a grumbling growling noise. Purring. PURRING. I love you Carlos. 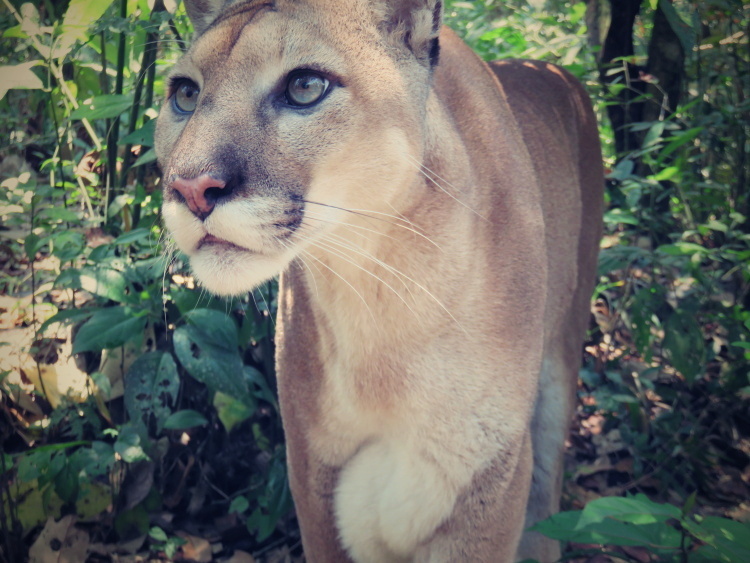 He is so close and so beautiful and purring…my hand slowly started moving towards the fence. NO! 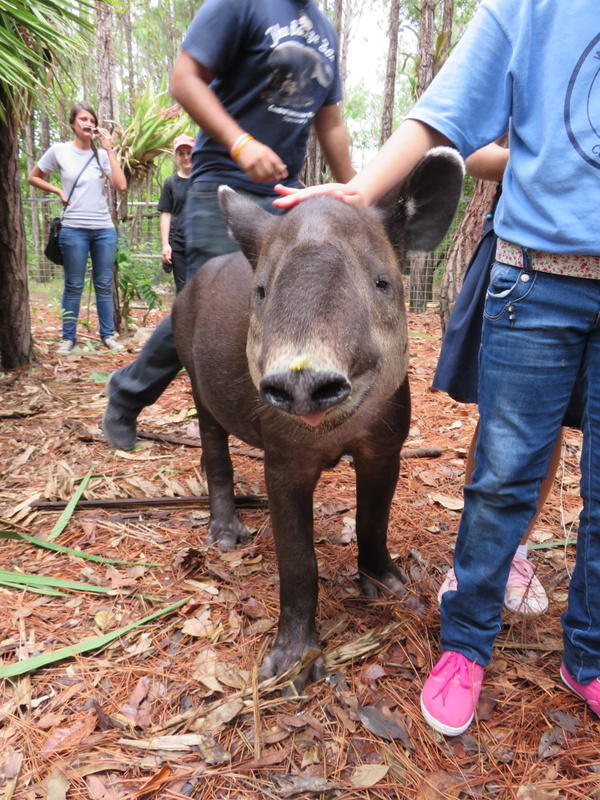 My friend the zoo keeper made it very clear that NO ONE touches Carlos. Not the employees, not Sharon, he is a wild animal and very dangerous. And I DO need both my paws. Don’t be sad! I’ll be back soon. I love the zoo. I love the zoo. I love the zoo. 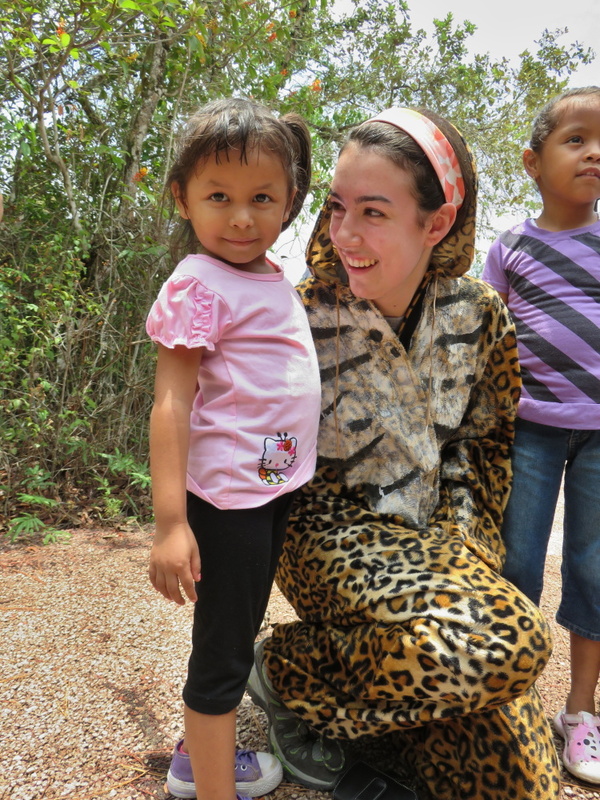 The monkeys, the cats, the birds, the employees, their mission, the founder, it’s an amazing amazing place. 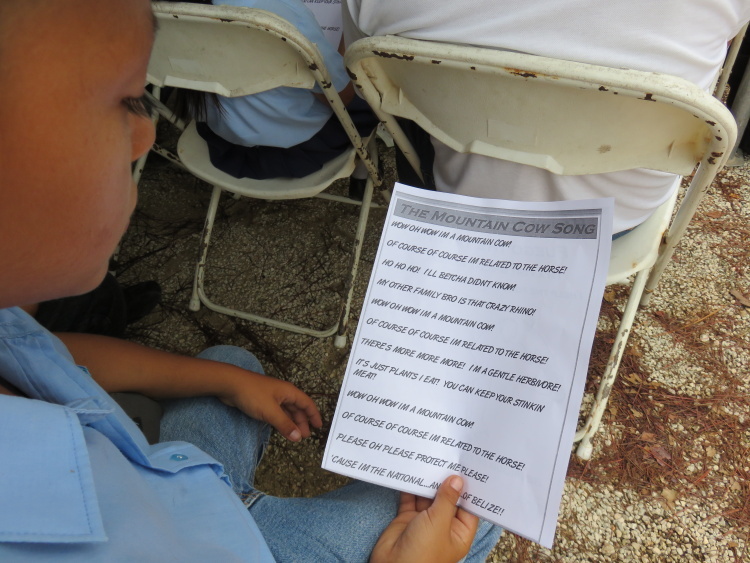 And has done so much for Belize. 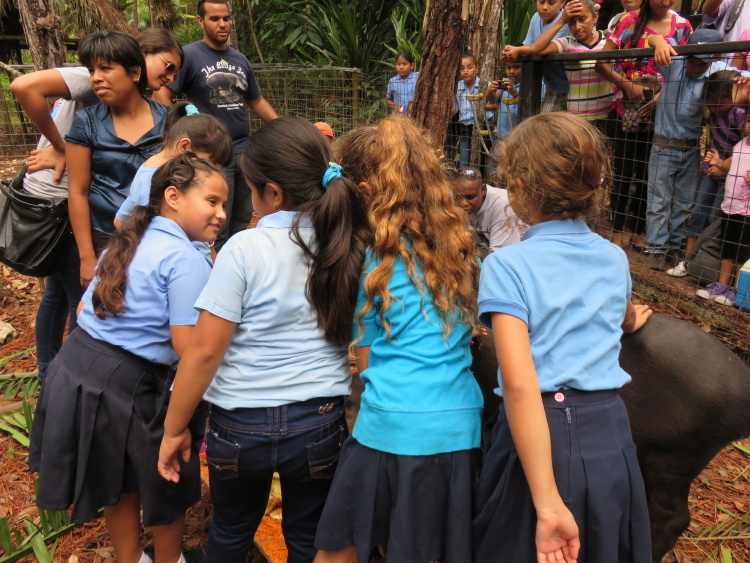 Educating children, adults and visitors about the local animals. 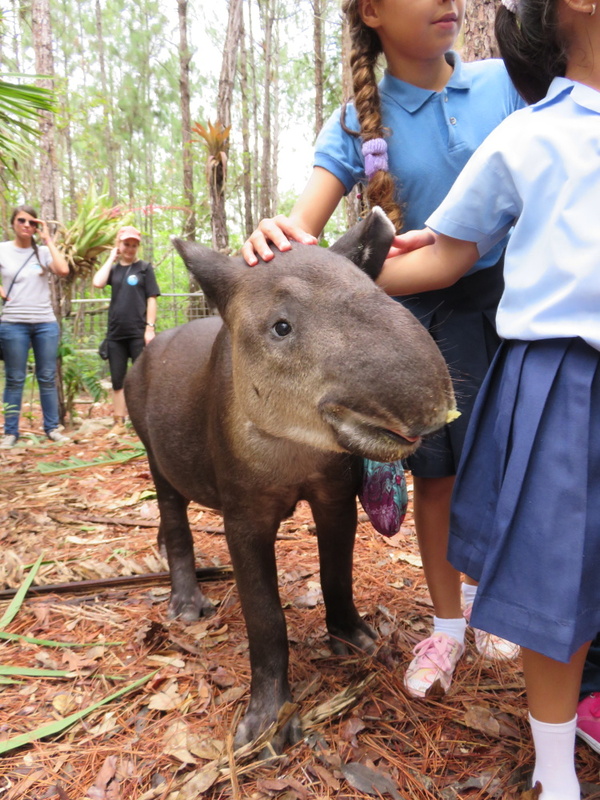 For information on the zoo, check out their site. And LOVE it on Facebook. And if you see Carlos, tell him I love him and I’m coming back for him. Thanks! What a wonderful day you had at such a great place. 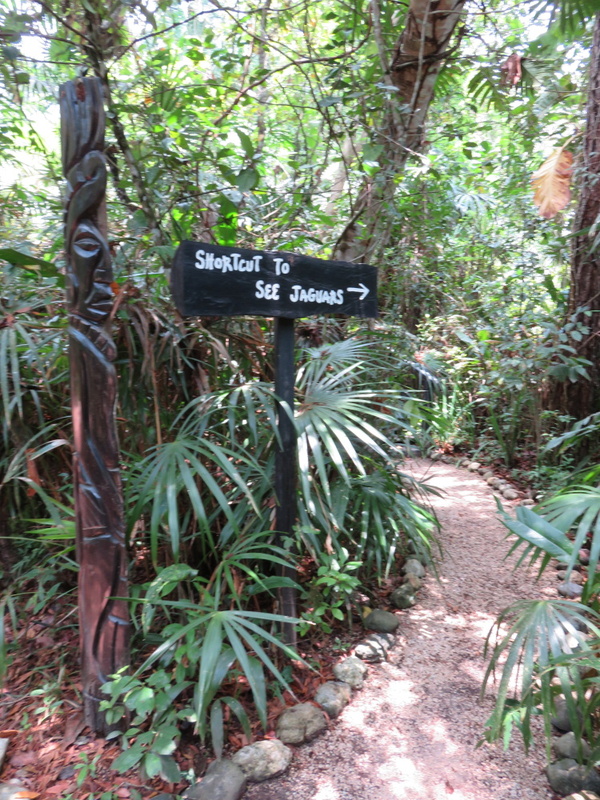 It’s one of the few places in Belize I really wanted to visit and never got to. But that’s reason enough for a trip back, right?! I loved the book The Last Flight of the Scarlet Macaw, and it made me even sadder that I never got to the zoo. Thanks to your great photos, I almost feel like I’ve been there. In spirit for sure. Fuego is adorable! Fuego is super cute. And when you scratch his neck, he lays down and practically falls asleep.